Scholarship recipients submitted applications and were selected based on evidence of commitment, leadership, achievement and financial need. The Foundation’s Scholarship Review Committee evaluated scholarship applications and provided recommendations to the Board of Trustees. Recipients were then approved by the Board of Trustees. The AAMD Education and Research Foundation is proud to announce the 2018 award winners. The AAMD Education and Research Foundation is proud to announce the 2017 award winners. Congratulations to all of these aspiring medical dosimetry students! The AAMD Education and Research Foundation is proud to announce the 2016 Student Scholarships. The AAMD Education and Research Foundation is proud to announce the 2015 Student Scholarships. The AAMD Education and Research Foundation is proud to announce the 2014 Student Scholarships. The AAMD Education and Research Foundation Board of Trustees is pleased to announce that nine scholarships were awarded to medical Dosimetry students this Spring. The Foundation Board has had another difficult time selecting as there were excellent candidates as well as an increase of nearly 50% in the number of applications to the Anna Gunilla Bentel Scholarship. The six recipients again showed academic excellence and leadership at a level which earns them the ability to be forever linked to the name of Gunilla Bentel. The Trustees feel these individuals will be among the next leaders in the profession. The Anna Gunilla Bentel Scholarship is restricted to tuition, books and fees. The Foundation Trustees also awarded two AAMD Founders Scholarships in honor of the founding members of the society. The recipients showed academic excellence and promise for the future. As a sign of our belief in this student, the Foundation Board of Trustees elected to award an additional scholarship to the recipient of the Gunilla Bentel scholarship who was limited by the restriction of the scholarship. The AAMD Education & Research Foundation Board of Directors is pleased to announce that 8 scholarships totaling $30,000 were awarded to medical dosimetry students this spring. The Foundation Board had a very difficult time selecting from the excellent candidates that applied for the Anna Gunilla Carleson Bentel Scholarship. The five recipients of this scholarship showed not only academic excellence and leadership, but also a commitment of dedication to the profession of medical dosimetry at a level that is appropriate to be linked with the name of Gunilla Bentel. 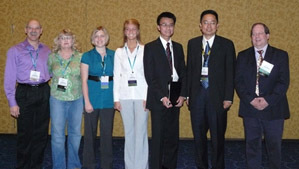 The Foundation Board also awarded two AAMD Founders Scholarships. The Founders Scholarship is named to honor those medical dosimetrists involved in founding the AAMD in 1975. Both medical dosimetry students selected for this award showed academic excellence and promise for the future. In addition the Foundation Board elected to award one scholarship for Special Recognition. This award went to a medical dosimetry student that desired to carry the profession of medical dosimetry and the field of radiation oncology to his home in Africa. This award was for $3,000.